POWER OF TWO: Sharpe and Williams' giving their all on "A Whole New World." With youthful spirit and tight vocal harmonies, a team of nearly 20 singers took to the stage at Redbones on Saturday night to contribute their time and awesome talents to Classic Duets, a benefit concert in aid of two talented and enthusiastic young male artists — Antonio Campbell and Rudolf Tomlinson — who are taking up studies at the Edna Manley College later this year. 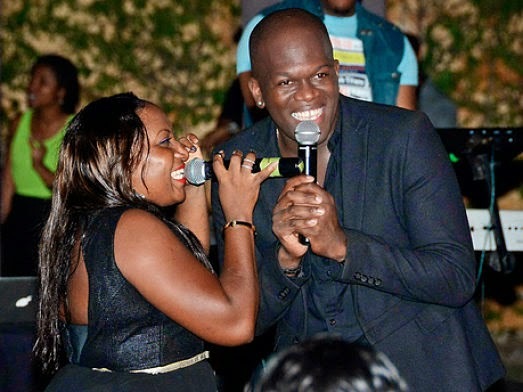 For TALLAWAH, Classic Duets displayed yet another powerful example of artists coming together in support of family in need. And it was an unqualified success, full of incredible yet improbable match-ups (Michael Sean Harris and Mario Evon sparring on "The Girl is Mine"), eargasmic and stylish artistry, and further evidence that Stephanie Wallace-Maxwell possesses a brilliance for organizing events of this kind. Still, as the pairings made clear, it was a total team effort, with performers bringing their A-game. I'm thinking of Aisha Davis and Stephanie bidding good riddance to their no-good men on "Enough is Enough (No More Tears)", a stellar scorcher made popular by Barbra Streisand and Donna Summer at the height of their careers. No doubt these original divas would have applauded the ladies' fabulous new interpretation. Hauntingly beautiful best describes the Mario Evon-Nickeisha Barnes treatment of "Say Something"; Stratdon and Nina Karle gave a breezy rendition of "Islands in the Stream" and Maranto and Roslyn Williams were as convincingly in sync (on "Set the Night to Music") as Ifidel Williams (a glorious tenor pitch) and Sherida Sharpe (a smoky, sultry alto) who beauifully serenaded the sizeable crowd with their take on "A Whole New World." Not everything worked, however. Harris and Kim Nain's "You're the One that I Want" dished up giddy vocal excess and Davis and Tomlinson's "Love Breaks Your Heart" underserved their natural gifts. But minor hiccups aside, the show yielded that singular element that makes the best duets work: dynamic chemistry, coupled with that quality audiences dig most in their entertainers — they seemed to be having a whale of a time.